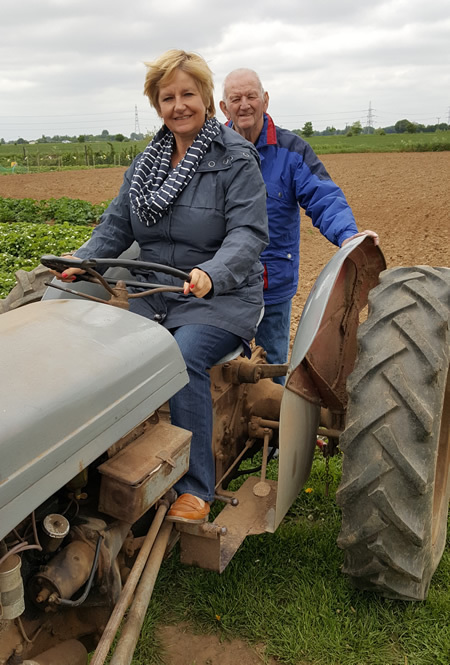 The month started off with a trip back to the UK by Peter to see his dad and brother. His flight to UK, delayed for 75 minutes at Auckland airport with problems in fuelling the aircraft, combined with a slow flight meant he missed his connecting flight to Birmingham and had to spend 7 hours at Dubai waiting for the next flight – which was also held up by a delay in fuelling. He finally arrived in Birmingham 37 hours after leaving work. He went down to see his dad every other day. 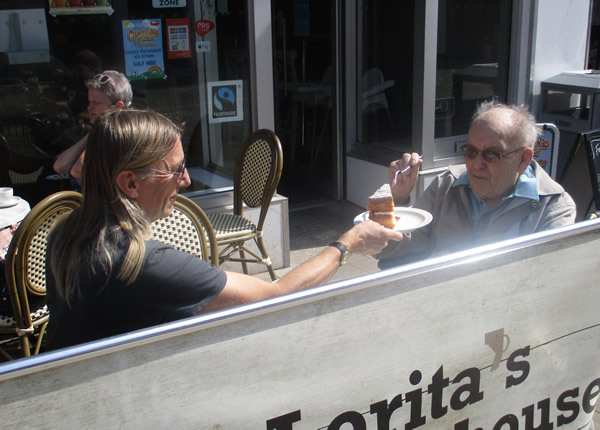 With some nice weather Peter and Dave were able to take John into Bromsgrove for a cup of coffee and a slice of cake. Whilst in the UK Peter went over to Peterborough for lunch with Ann’s dad, Mike, and up to Wolverhampton to see Lily, our old neighbour in Westcroft. Peter’s suitcase was much heavier on the way back with two special pots for Ann from David at Walsall Studio Ceramics…..
…..plus a few other pots from Walsall and Dan Barton as well as McVities digestives, fudge fingers and twiglets for Ann. The girls missed Peter lots. 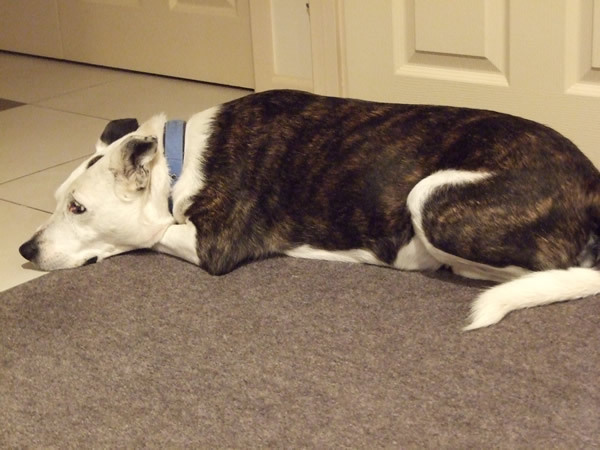 The first evening Maxie lay by the front door for ages waiting for him to come home. 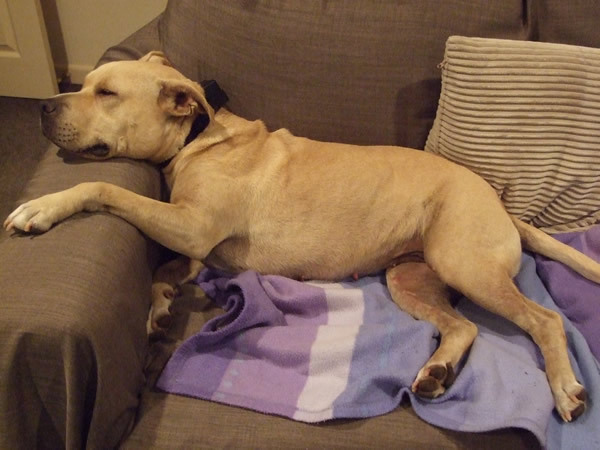 Honey, who has a very relaxed attitude to life, didn’t seem to even notice he was gone! 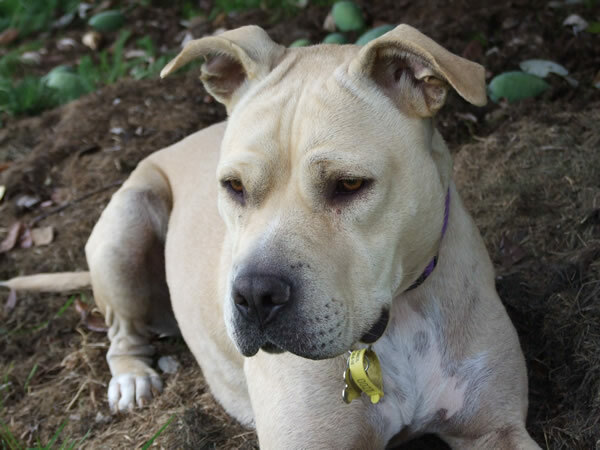 Because Honey is like a demon on narcotics when she sees a cat on our walks Ann had to perambulate the girls in relays. So she drove down to the pub, parked the car and walked Maxie first whilst Honey waited in the car. The idea being that there would be lots for the girls to watch whilst waiting for their turn. However Honey didn’t like being left behind in the car by herself and howled and whined throughout Maxie’s walk. So embarrassing. 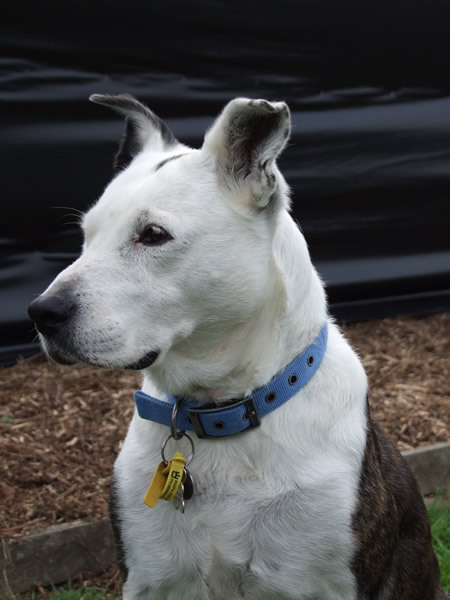 The girls were very happy when Peter arrived home – especially Maxie. And of course once she got over her excitement she then ignored him completely for the next few hours – his punishment for deserting her. We can tell that winter is on its way as the mice have started to move indoors. Two days before Peter flew back to the UK he saw a mouse racing around the garage. His solution to the problem – set a trap (a humane one thankfully) then leave Ann to deal with the result! However the mouse was most obliging and only got trapped the day Peter returned so he was able to take it down to the end of the section and release it into the empty section next door. In the last couple of weeks we’ve managed to catch 3 mice (so far)! The weather for the last couple of weekends has been very wet so we’ve not been able to do much in the garden so we’ve started repotting the bonsai. 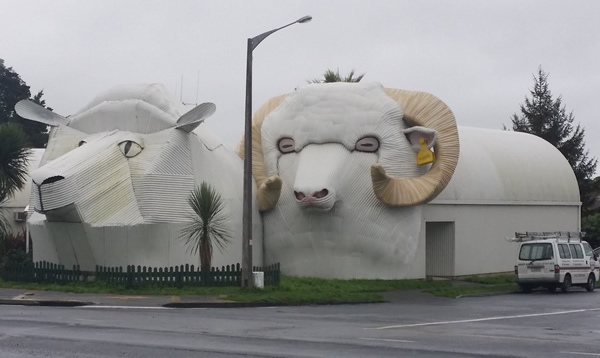 Those of you who have been over to see us may remember the tin sheep in Tirau. Well after a long wait she now has a boyfriend. The girls love posing for the camera …..
… we think they’re secretly competing for the ‘Most Gorgeous Girl’ award! 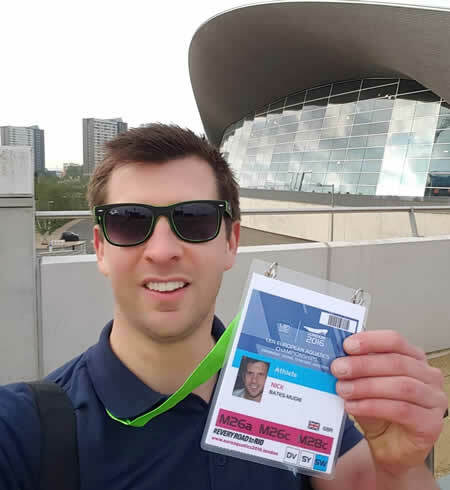 Well done to Nick – swimming 100m freestyle in the European Masters Championships in London last weekend. Top Brit in his heat! 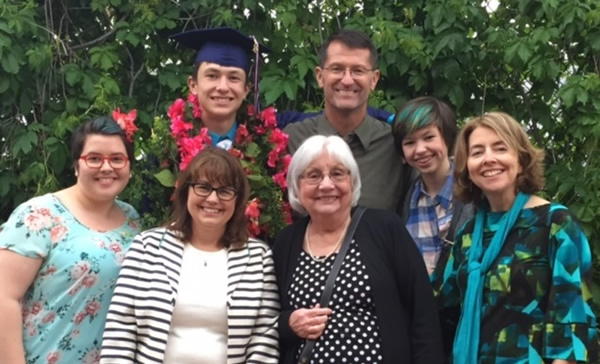 Michael celebrated the end of high school with his graduation last week. 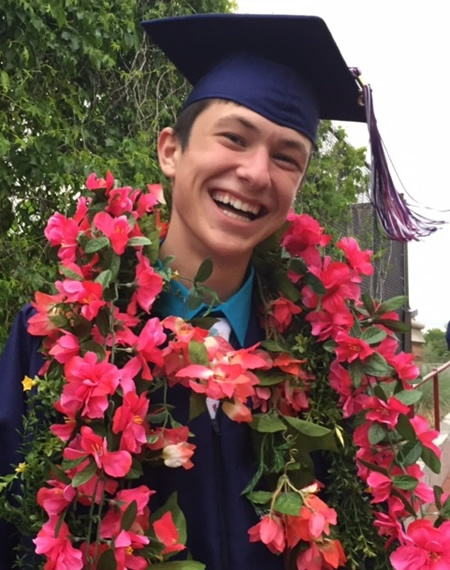 Next stop – Colorado State University to study physics. 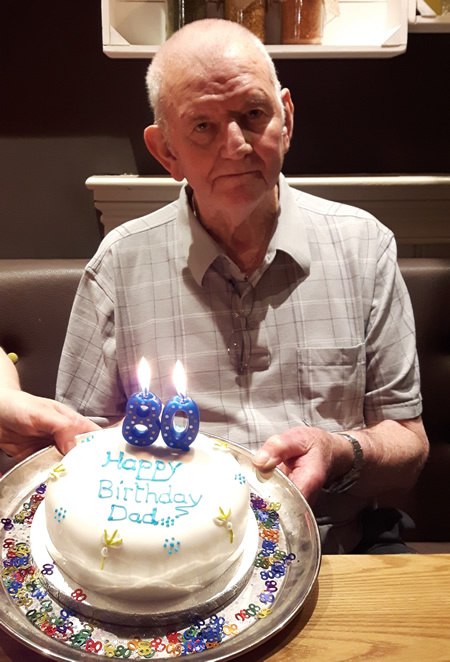 Mike celebrated his 80th birthday with a party organised by Carol and David, and a visit from his baby sister, Shan.